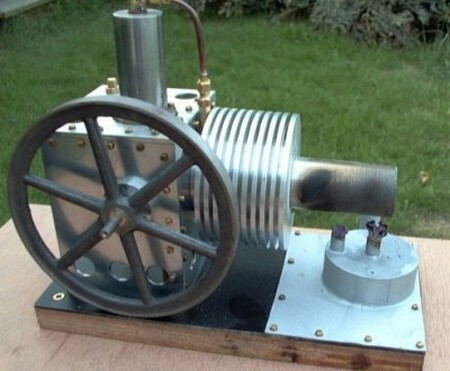 A Stirling Engine is a simple and easy kind of engine to be constructed. You can make this from crap materials which is why they are so easy to construct. The Engine can rotate up to a maximum of 300 rpm. You first need to construct a ring stand. Use the coke tins for this step. Cut the tins in equal halves. Cut open the side of the can of the bottom piece of the Coke tin. Form the can into a ring. Make three legs. The sides of the cans have to be bent and cut to make the shape of a ring. Now, you need to construct a pressure vessel. Use another Coke can tin to make this. Scrape off the sides of the tin. Remove the upper part of the tin to make your vessel. This is actually the lower portion of the pressure vessel. Now to make the upper part of the pressure vessel. Use a Coke can tin and cut two inches off the bottom. Puncture a hole in the middle of the bottom tin with a straight pin. Glue a rectandualr shaped steel plate and bolt to the inside center to the top part of your pressure vessel. Gluing this will help prevent any potential for leaks. The displacer is constructed similar to the pressure vessel. However, we will use Red Bull tins for this. The displacer needs to be placed inside the pressure vessel. Make every effort to verify that no leaks are taking place. Make the crankshaft from the coat hanger. We need to make sure the crank is supported since we punctured holes in the Red Bull tins. Attach the crank to the supporting materials. Attach the crank on the upper part of the pressure vessel. Cut the balloon to form of a disc. This will be a diaphragm. The diaphragm joins the crank and the disk and needs to be strong so it will not be damaged while the engine is in motion. 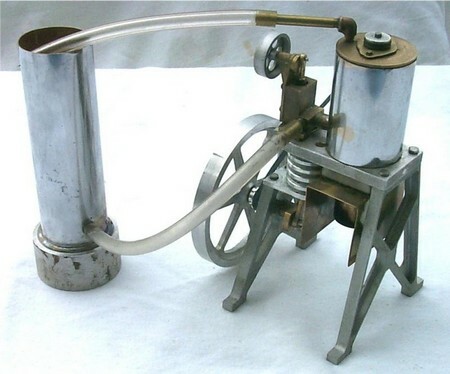 Your Stirling Engine is now ready. Test run the Stirling Engine. To do this, heat the bottom part of the pressure vessel for 20 seconds. Now, push the flywheel gently. The wheel will to start to spin. Keep constant cool air on the pressure vessel. You do not want it to overheat. You can use ice to do this. Place it on top of the vessel. However, do not let water get into your Stirling Engine. If water gets into the engine you may have to build a new one altogether.